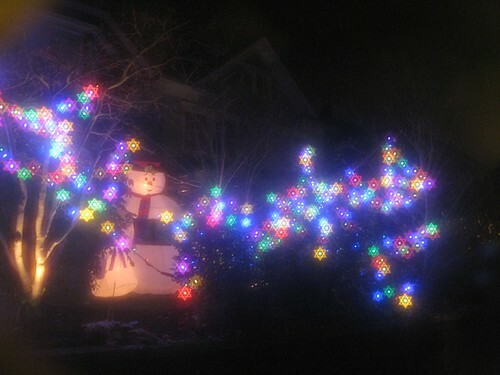 snowman with Jewish star lights, originally uploaded by jillbertini. The Seattle Metropolitan magazine, as much as we like to tease the big, chubby glossy, did sites like CHS a big Frosty the Snowman with Chanukah lights favor this year and did some of the grunt work of assembling the “who’s open on Christmas” list 2011 edition. Here’s their guide to selections from across the city. We’ve gladly accepted their gift, below, plus added some of our own findings if you’re planning to go out on the town this weekend. We’ll have details on the coffee, grocery store, etc. end of the equation later this week. Barrio is closed Christmas Eve and Christmas Day but peddling tequila New Year’s Eve and New Year’s Day. Café Presse will serve until 2 on Christmas Eve, close on Christmas Day, and open on New Year’s Eve and Day. Canon will be open Christmas Eve and New Year’s Eve (if you want dinner for the latter you need to arrange tickets). Elysian Brewing Company will be open till 5 on Christmas Eve and New Year’s Eve but closed Christmas and New Year’s Day. Liberty Bar is open all four days. Ditto Linda’s Tavern, with lights going on at 5pm on Christmas Day. The Redwood is open for regular business on Christmas Eve and New Year’s Eve, and open from 6pm–2am on Christmas Day and New Year’s Day. The Saint will open only for New Year’s Eve. Smith is open Christmas Eve, New Year’s Eve, and New Year’s Day. The Tin Table is open every day but Christmas. Sun Liquor will be open all four days. Vermillion is open Christmas Eve and New Year’s Eve, closed on Christmas and New Year’s Day. Saturday Dec 24 (Ghristmas Eve): 4pm – at least midnight. If business warrants, we will keep the drinks flowing until 2am. Did the Seattle Metropolitan think the gay grinch canceled Christmas on the Hill? Must have cause it looks like they seem to think that nobody on Capitol Hill will be or will want to be patronizing gay watering holes or restaurants. The Lookout will be open Christmas and New Years as well. The Bus Stop bar on Olive Way has not been closed one day since it opened in December, 2008. They’ll be open Christmas Eve, Christmas day, New Year’s Eve and New Year’s day. Big Mario’s New York Pizza and Lounge is open from 11am – 4am Christmas Eve, and 11am – 2am Christmas day. Pizza, drinks, and football. The 5 Point Cafe is always open and will be serving a special Christmas prime rib dinner in addition to the regular menu all day Christmas Day. The bar opens at 6am Christmas morning, so come drink before you have to see your family. And we’ll be showing all those xmas football games and probably ‘A Christmas Story’ too. Chungee’s is open Christmas Eve. Stop by! Closed Christmas Day. La Cocina will be open Christmas Eve and Christmas the owner also informed me that they are clearing out ALL the tables for a HUGE NYE Latino dance party with DJs and lots of margaritas! Linda’s opens at 7pm on Christmas night, not 5. And we’re open all day on Christmas Eve, from 10am-2am! CC Attle’s will be open from 2pm-2am on Christmas Eve, Christmas Day, New Years Eve and New Years Day. Our Kitchen will be open from 3pm through 10pm on those dates. The Hideout on First Hill (@ Boren & Madison) will be open on Christmas day!